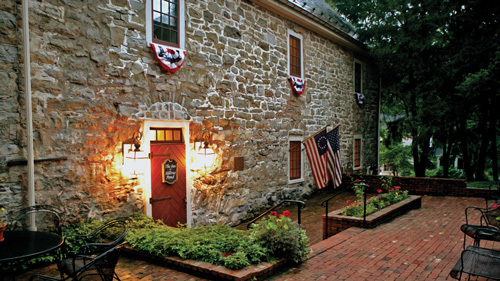 The historic and scenic river towns of Easton, Portland, Columbia, Belvidere and Phillipsburg all merit in-depth exploration of their own, but this forty-eight-mile loop tour emphasizes the old roads connecting them. View from St. Anthony's Nose north of Easton, PA, looking north up the Delaware River toward Martins Creek. Marble Mountain is straight across the river in New Jersey. At the traffic light at the Pennsylvania end of the "free bridge" from Phillipsburg, NJ, to Easton, make a right turn onto Route 611 North toward Martins Creek. Carefully follow the signs as the road negotiates its way through the edge of town, finally heading north along the Delaware River, passing quaint old houses standing close together. Out in the river is an island named for Charles Getter, who was hanged there in 1833 for murdering his wife. A crowd of 25,000 people arrived to witness the hanging, the last public execution in Pennsylvania. A few years later, in 1860, the paddle-wheeled steamship Alfred Thomas, on its maiden voyage to establish a route up the Delaware River, exploded near the northern end of Getter's Island, fatally injuring twenty passengers. The dream of a commercial steamship route on the river was never fulfilled, but in the 1870s the flat-bottomed propeller-driven Kittatinny finally conquered the river's treacherous waters by pushing upriver through the Delaware Water Gap and then to Port Jervis. For many years afterward the Kittatinny cruised the waters of the Delaware Water Gap as a sightseeing boat for tourists. Ahead, Chestnut Hill on the PA side and Marble Mountain on the NJ side form Weygadt Gap. Late 1600s explorers from Holland called it Whorrogott, thought to mean the "wind gate." Those that have canoed this stretch of river are familiar with how the wind picks up as air is forced through the gap's narrow opening. In the gap, a rock formation called St. Anthony's Nose towers over Route 611. The elegant Paxinosa Inn was constructed on top of Chestnut Hill in 1898, and a trolley line connected the mountaintop inn to Easton. The hotel burned down in 1905, but the old trolley bed is still visible after a light snow as a white line coming down the mountain. North of Pasch Marine, past a picturesque group of well kept, quaint old houses tucked tightly beneath the steep rocky side of Chestnut Hill, there is a scenic outlook along the river. The road follows the river closely between Frost Hollow and Frutchey Hill roads, offering beautiful glimpses of the river in between the riverside homes. After the Civil War, Adam Yop cut into a small cave along here while quarrying limestone. The cave was cold enough to enable him to chill his drinks inside it, and Yop acquired a license to sell beer and other drinks to the public, who were charged ten cents admission. In the 1930s a small roadside stand here stated "Indian Cave" on its signboard. Route 611 curves around to the right, and just after Mud Run Road, the massive storage towers of the old Alpha Portland Cement Company loom into view, with a massive quarry behind. The Con Agra Flour Milling Company converted these towers in 1960 for storage of flour. Across from the towers is the Delaware River Sandt's Eddy access ramp and boat launch, shared by boaters, canoeists, kayakers, and tubers. In 1942, thirty-one men died when twenty tons of dynamite exploded prematurely during preparation for a blast at this Sandt's Eddy quarry. Windows were shattered in homes and buildings in an area eighteen miles wide, and the blast was felt fifty miles away. A hotel proprietress about a quarter-mile from the quarry said, "window glass was flying all over the place, and big stones began raining down on the roof." As Route 611 swings away from the river--paralleling Martins Creek, for which the town is named--another defunct cement facility appears, the cliffs behind it giving some scope of the amount of limestone quarried out over the years. 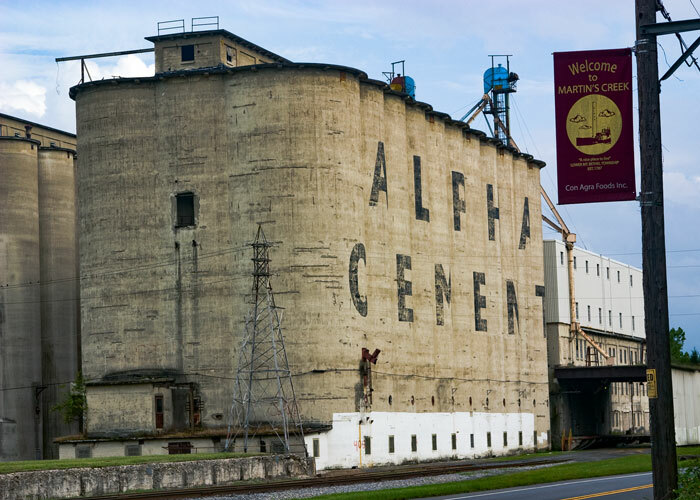 The cement industry was once king here, and, in their heyday, the Alpha Portland and Lehigh Portland companies built clusters of company houses on both sides of the Delaware to attract workers. Over time there have been at least five church buildings on Three Church Hill, just east of Martins Creek. Both Gilbert Tennent and David Brainerd, famous preachers in the early eighteenth century, gave sermons here. Outside of Martins Creek, Route 611 climbs a long gentle grade as it approaches Three Church Hill where Presbyterians built the first church as early as the 1730s. 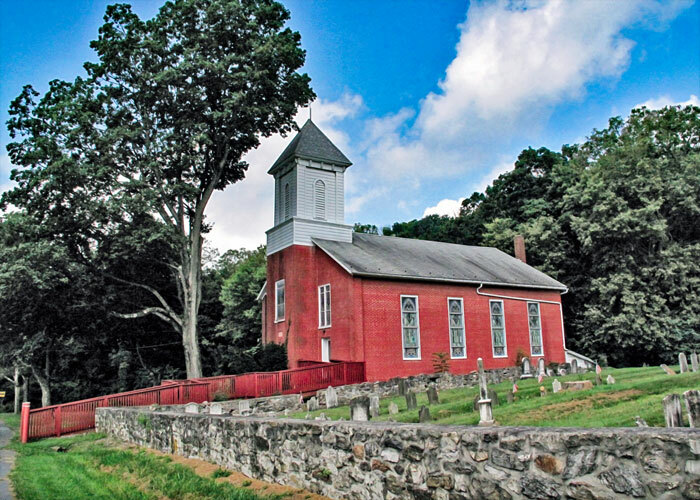 At one time during the mid-1800s, the Reformed and the Lutheran congregations shared a church near the top of the hill, but in the 1860s the Lutherans split away, building a church of their own. The Presbyterian church's graveyard, located close to the Lutheran church, contains many ancient grave markers. The large cemetery sitting near the top of the hill is not associated with any of the churches here. Part way up the hill, Route 611 turns sharply to the left, but continue straight ahead onto Martins Creek-Belvidere Highway. The grand vista ahead is the Delaware Valley between Belvidere (NJ), Sandt's Eddy, and beyond. The mountain range across the river is Scott's Mountain in New Jersey. The huge cooling towers in the distance, which sometimes erroneously identify the facility as nuclear-powered, are part of the Martins Creek Pennsylvania Power and Light generating station. The power plant employs over a hundred people full time and sits on a 750-acre site along the Delaware River, including 215 acres for public recreation, hiking trails and a boat launch. The generating units today are fired by oil or natural gas. The Tekening Trails, part of PP&L's Martins Creek Environmental Preserve, are open to hiking and mountain biking. 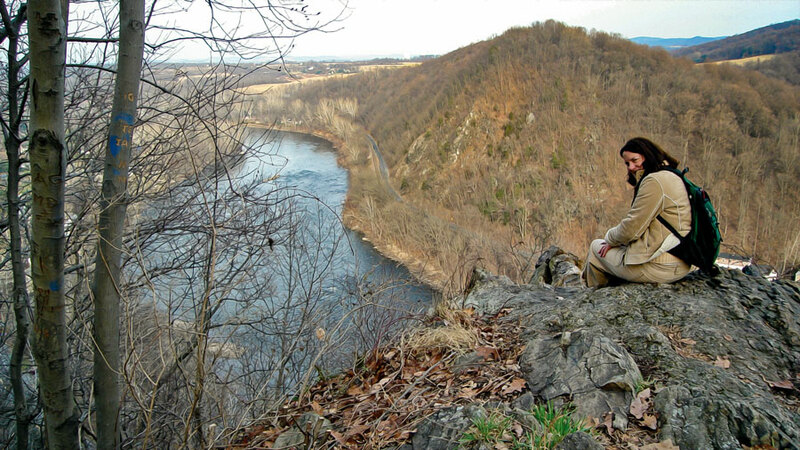 The longest trail parallels the Delaware River for two miles, giving hikers a dry and safe outlook over the dangerous Foul Rift rapids. Other trails lead through former farm fields and pastures now reverting back to natural habitat. Some of the wooded trails lead through the last remaining stands of old-growth forest in Northampton County, where a variety of bird and mammal species reside. Riverton is the small hamlet located at the end of the Martins Creek Highway by the Belvidere-Riverton bridge. Just before the bridge, turn left and head upriver on Riverton Road, which for the next mile offers beautiful views of the river. At the stop sign, be careful while you make the very sharp turn uphill onto River Road and continue up the grade to the edge of a steep drop-off high above the river. 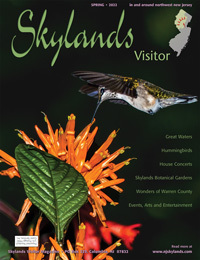 Across the river is a square mile of privately owned "wilderness." In the late 1930s, anticipating problems in Europe, the government clandestinely acquired land on which war materiel could be manufactured with minimal threat of sabotage. Hercules Powder Company manufactured smokeless powder for military munitions, building large storage bunkers (now gone), connected to the factory by a system of lanes that still show up on USGS topographic maps. Older residents still recall the excitement caused on the day in the 1940s when "something blew up" in there. At the stop sign turn right to continue on River Road toward Portland, PA six miles ahead. After passing through idyllic fields and woods for a few miles, the river road bends around Driftstone Campground, located on the banks of the river adjacent to Attin's Island. Next to the campground, a cemetery contains the graves of several Revolutionary War veterans from the Aten family among the seventy-or-so plots. Past the cemetery the road hugs the bank high above the river, approaching the site of the sprawling Tuscarora Inn, a Christian conference center that hosts more than 20,000 guests each year. As the road continues, a dark and rusty Delaware, Lackawanna and Western (DL&W) railroad bridge appears over the river. It replaced an older bridge that was then sold to Reverend Darlington, who built highway ramps at either and charged a toll to cross it. To guarantee his success, the Reverend bought the competing ferry business just downstream and closed it. By 1953, the Joint Toll Bridge Commission opened the Portland-Columbia highway bridge used today a short distance upriver, and Darlington's bridge was torn down, another lost landmark. Farther up the river road is Reliant Energy's Portland generating station, a coal-fired power plant. Bald eagles have nested for a few years now at the northern end of the company's property, rearing a total of about a dozen young eaglets on the site. Viewing the eagles demands common sense and deep respect for their need for privacy. There are also nesting platforms used mostly by ospreys. As the River Road approaches the Portland-Columbia bridge ramps, follow the signs for New Jersey and, at the end of the bridge, bear right to merge onto Route 46 East, quickly crossing over the Paulins Kill. The "river road-to-be" was blocked for years by the mountain ahead that dropped straight into the river and turned sharply at Walnut Road over the mountain. 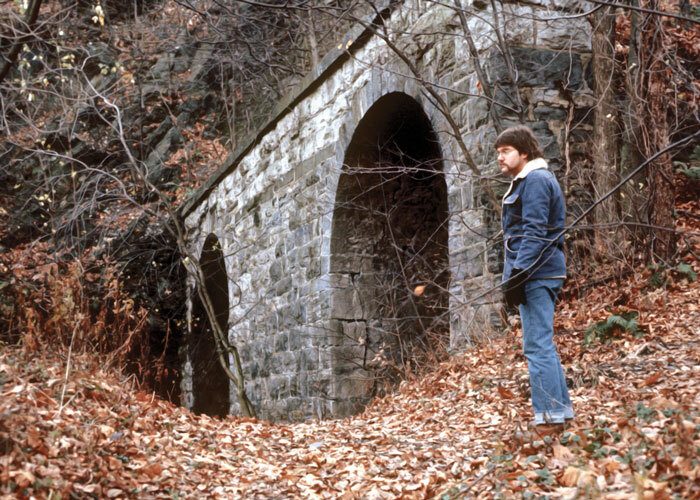 In the 1870s the Blairstown Railroad blasted away the obstructing cliff, carving out a narrow ledge for its tracks from Columbia to Delaware Station, now Delaware. Finally in 1931, some years after the railway was abandoned, more of the cliff was blasted away and the new state highway, now Route 46, was constructed on the old rail bed. On the grounds of the Delaware Family Campground, the former Fort Ellison (or Allison), one of a chain of forts built to protect mid-1700s settlers from Indian attack, houses campground employees, its stonework beautifully intact. Route 46 passes the eastern end of the old DL&W bridge and the lost Darlington bridge, and enters the edge of Delaware, NJ. In the 1800s people came to this area to rent a piece of riverfront and set up tents for the summer. Later, hundreds of boys and girls camped at Eagles Nest Farm from the 1920s until its closure in the 1970s. Today, the buildings are gone, and the land is owned by Gray's trucking company. Next to the old Eagles Nest Farm is the Delaware River Family Campground where campers still enjoy a lovely area along the river, and a boat launch. Large Indian villages once occupied most of the river flats along here, the remains of which were still standing when the early farmers plowed their fields. On one of these flats near the end of Knowlton Road is Marshall's vegetable & fruit stand. The old cemetery past Marshall's marks the northern edge of Ramseyburg, another lost hamlet. There were saw mills, a clover mill, a wheelwright shop, two blacksmith shops, two churches, a schoolhouse and even a hotel, once known as Spring Brook Place, destroyed by an arsonist's fire in 1997. The Manunka Chunk tunnels are still a favorite find for railfans. Beyond Ramseyburg, on the ledge above Mike's Tikes daycare center, the Bel-Del railroad terminated at its junction with the DL&W at the portals of double railroad tunnels. The site once had freight depot buildings and platforms, a small covered passenger platform and a house in which the station agent and his family lived. Frequent flash floods rushed through the tunnels during heavy rain, one of which toppled the agent's house in 1887. In the river, near the lost railway junction, is Dildine Island on which the Manunka Chunk House once offered lodging and recreation for turn-of-the-century tourists. Even though it was surrounded by water, in 1938 the hotel was destroyed by fire. As Route 46 heads uphill toward the traffic light, exit the highway and turn right onto Manunka Chunk Road, passing alongside the property of Brothers of the Sacred Heart and the former Hoffman-LaRoche factory complex on the right. At the stop sign at the end of Manunka Chunk Road, turn left into Belvidere, noted for its Victorian homes and friendly streets. Continuing straight through the traffic light, the road crosses over the Pequest River, through town and up a gradual incline. Look for Foul Rift Road on the right (across from a small laundromat), which, before the railroads, was the main entrance to town. Soon Foul Rift Road turns sharply, crossing a short and narrow bridge over the former Bel-Del tracks. As the road drops down to the river's edge, the huge cooling towers of the PP&L Martins Creek power station jump into view again. Just a few years ago, more than two-dozen cottages lined the east side of the road, the river defining the border of their front yards. The properties were leased from the power company, which, in light of potential liabilities from future river floods, gave notice to the tenants to vacate and had the cottages razed. Foul Rift, the hamlet, took its name from Foul Rift, the rapids in the river, claimed by most who have negotiated them as the most dangerous part of the Delaware. 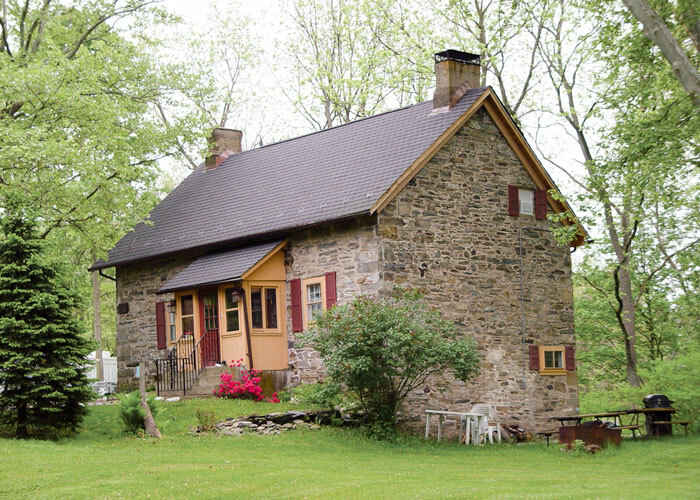 Although the Delaware River nearby drops twenty-two feet in a half mile and might have provided the muscle to drive the mills of long ago, only one attempt was made to utilize the water's power. In 1814 William Sherlock constructed the Rifton Mills along the river, but they were destroyed by fire in 1856 and never rebuilt. Continue through the narrow railroad underpass, staying straight on Foul Rift Road for about a mile and turn right onto Route 519 south, the Belvidere Pike. A short distance beyond Lommason's Glen Road, the highway passes through a small hamlet for which no maps give a name. One of the old homes here was called White Hall, the mansion of Alexander White, one of the earliest settlers in the area, and whose son, William, was one of the first two soldiers from Warren County to join the forces against the British during the Revolutionary War. From the balcony of White Hall, William Henry Harrison is said to have delivered a presidential campaign speech, and it has been claimed that General Washington stopped here while enroute from Bethlehem, PA, to his encampment at Morristown. Soon Route 519 enters another early hamlet called Roxburg, where you should turn right onto Roxburg Station Road (CR 622). The road turns left, becoming Hutchinson River Road, passing by homes still inhabited and healthy even after recent floods. After an S-turn, the road passes through a narrow railroad underpass, and then passes Reeder Road. Turn right onto River Road, which follows the river on a higher elevation. On the river's edge below, the pumping station for Merrill Creek Reservoir drives water up Scott's Mountain for storage until required to augment the level of the Delaware. At the stop sign, turn right onto Garrison Road, which soon curves sharply left to become the river road. And at the next stop sign, turn right onto Brainards Road, which leads into the hamlet of Brainards. The Alpha Portland Cement Company built houses to attract workers who could walk to work in Martins Creek, PA, on the railroad bridge over the river. 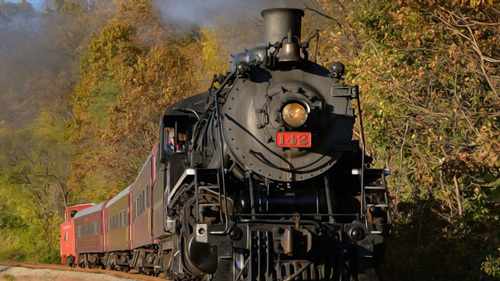 Despite being named for missionary brothers, the town had no church, and residents took the train to Belvidere or Phillipsburg for religious services. Almost immediately after turning downriver on River Road at Brainards, the road passes by the site of the old Harmony Speedway on the left, then past another small cluster of homes at Harmony Station, assigned its name by the railroad. And near Marble Mountain Road on the NJ side of Weygadt Gap, the river road squeezes between the railroad tracks and cliffs at "the Narrows." Near the top of Marble Mountain is the "ice cave," actually the former Fulmer iron mine, with an intriguing array of ice stalagmites that form when the air is cold enough to freeze the dripping water inside. In Phillipsburg the river road becomes North Main Street. At the stop sign turn right onto Hillcrest Boulevard and North Third Street, following around to the stop sign and turning left on Broad Street, which becomes North Main Street. At the traffic light in Union Square turn right to the "free bridge" where you began. E-mail the author with comments or questions.